We might not be able to become old money, but we can still buy some actual old money! A few weeks ago on twitter (follow me! ), a few of us ended up chatting about money collections that we have from our travels, or from gifts. Liquid Independence brought up the idea of giving a gift of old money, especially mint condition from your country of origin. I have been wanting a framed bill from Zimbabwe for quite awhile, myself. No, I’m not from Zim, but they have $100 trillion dollar bills!! The best part? 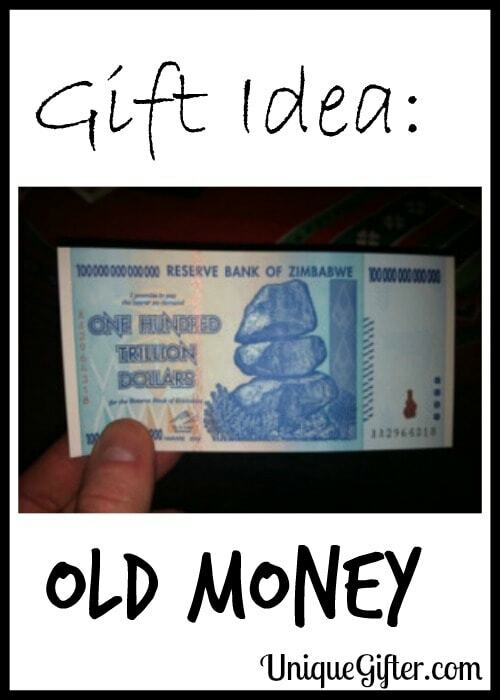 (Worst, if you’re from Zimbabwe and dealing with their hyperinflation.) They cost about $6 Canadian on eBay. Seriously. You can check it out here. Money looks pretty neat when it is in a picture frame. If you are looking for a memorable wedding gift, especially for a couple from two different cultural or national origins, consider getting two mint bills. Put them in a frame next to each other. Depending on the currency, you could say “You’re both perfect tens” in your card, for example. Feel free to tell the couple that you got them cash, only give them this framed version and then surprise them a few days later with an eTransfer or a cheque in a card! “Where do I buy mint currency?” you might ask. Well, if you are lucky, your nation’s mint sells such things! In Canada, you can visit mint.ca to find out more about the Royal Canadian Mint. Alternatively, check out eBay for quite a large selection. Perhaps you are looking for a gift idea for a traveller in your life. It may require some conspiring with the traveller’s significant other, but you could have their spare change collection 3D mounted in a frame. You can get quite creative with how you choose to lay them out. Take your idea of a pattern or design to your local framer or to a place like Michaels. Note that 3D framing tends to cost a pretty penny. Do you have a money collection or some pristine bills at home? I passively collect money from around the world. I like to get it from friends who either live in other countries or traveled to other countries so that there is a story behind it. Another idea is to get casino chips at casinos when you are abroad and give it to your friends who like playing cards. I have a chip from Melbourne and it's nice to have a story behind it and whatnot. It's funny you mention the poker chips. On my first backpacking weekend in Europe I met a guy from California who carried chips around with him, because he knew how to do a bunch of hand tricks and stuff with them. They were basically his "clicking the pen" when he was standing in line and stuff, practicing different slights of hands and flips! I did an inventory count at an airport once in the currency exchange centers. Most fun I've ever had haha! All the currencies are so pretty – specifically the swiss franc. This would definitely be a really great gift! Oh hey, you like accounting? Funny, that ;-) I've never seen Swiss Francs, that I can remember anyway. I have some Swiss-passport carrying relatives, I should see if they have some I can look at! I think they were even over there recently. What a cool idea Anne…love it. So perfect for couples from different countries! Indeed. I think it would also make a great goodbye gift for an ex-pat leaving a country! My boyfriend has a huge coin collection and it can be a good gift that appreciates in value with time if you give a gold coin for example. But you have to know how rare is a coin, most of them even if they are 100 years old are barely worth more than their weight in silver or gold. I collect coins, bank notes, and stamps from all over the world :D I have some old German Marks from WW1 era. They printed bills in 5 million denominations, but as soon as it got into people's hands the notes lost half of it's value already so the government had to keep creating new bills with higher face values. You can easily find these notes in mint condition today even though they're almost 100 years old because so many were printed and most people just kept them stored away in their dressers. They weren't spent or used because people wouldn't accept them as a form of payment since they lost value so quickly. That's what happens when a country prints too much money lol. Thanks for the mention. Fascinating, I had no idea! Thanks for sharing. I saw a lot of Ost Marks in museums in Berlin, but not WW1 era ones. Dooo it! And let me know how it goes. Do you have a fun way to display your collection yet? Glad you like it :-) That's awesome that you even have the Zimbabwean notes! Oh fun! Have you ever done a post on the money in Grenada? The only thing I collect from around the world is postcards and patches. I collect patches too! I'm running out of space on my backpacking bag :-) Worse things have happened though.